My annual summer hiatus from blogging is nearing an end. Though with the record-setting rain Fairbanks had this summer, as reported by the Fairbanks Daily News-Miner, I easily could have found more time for blogging. Thanks to all those who continued to visit. Animal Eyes is a Portland-based band comprised entirely of members from Alaska, who all met in Portland. It’s a small world. They rocked hard and long, during this June 31 concert at local dive bar The Marlin. 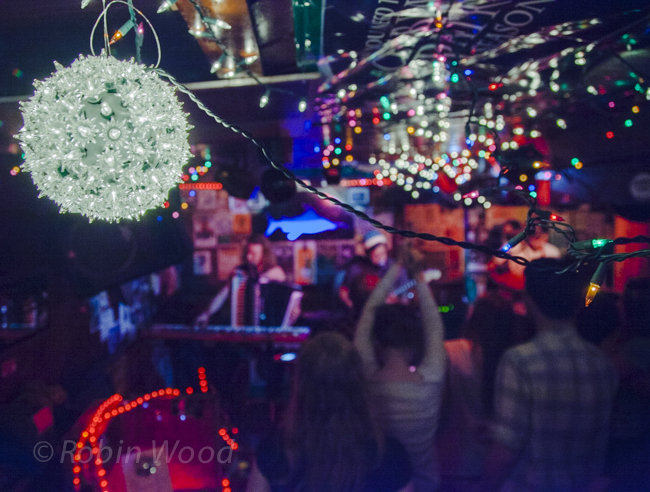 Animal Eyes performs at The Marlin on June 31, 2014. Lights strung around The Marlin during an Animal Eyes concert. Fantastic Weather, Fun Skiing in Fairbanks. Above: Snow-covered spruce trees lead to a hill north of Fairbanks briefly blanketed by the golden glow of sunrise. While much of North America is recovering from the recent polar vortex, Fairbanks has been experience lovely weather. Temperatures were above zero degrees fahrenheit for much of December and January, including plenty of balmy days up into the 20-degree range. Not to say we haven’t had cold weather – last weekend was 40-below – but it has felt pretty mild so far. All that warm weather was ideal for cross-country skiing. Nordic skiing is easily one of the best ways to enjoy the outdoors while getting a killer workout. One of the outings was directed toward a frozen pond (in the summer nothing more then a swamp,) overlooked by a old cabin on the bank. Whispery clouds provided a canvas for the pink and orange sunset to blanket. Closeup of an old cabin. Above: A quiet and foggy beginning to the 2013-2014 season at Skiland. December 7, 2013 at 10:12 a.m.
December 7, 2013, marked the start of the downhill season at Skiland – the farthest-north chairlift in North America. Opening day is often a mad dash; wake up after a party; corral people, some gear, and grub; then try to get there for first run at 10 a.m., because last run comes quick at 2:30 p.m. This year was relaxed, waxed boards the night before and went to bed at a reasonable time. The next day lots of clouds made visibility difficult, but unseasonably warm temperatures – over 10 degrees fahrenheit – complemented a snowpack that hide reasonable numbers of rocks! Not much lifts the spirits in dark and typically cold December then an early opening at the downhill. Here’s a few examples of rapidly-changing light from the chairlift. Sitting in a cloud, prepping for the second run of the season. Visibility remained elusive, even worsening as the morning progressed – 10:42 a.m.
By 1:58 the sun was in decline, and direct sunlight had all but passed. With one hour left to snowboard, at 1:48 p.m., the sun had broken some clouds – revealing spectacular scenery.